Our patients are very important to us at Quayside dental, and a part of what’s special about having been in business for 33 years here in North Vancouver is the way that we’ve gotten to know successive generations of families. It’s nice for Dr. Moghaddam and his staff to see youngsters grow into adults with healthy, strong, and fully functional teeth, many of whom have experienced little to nothing in the way of tooth decay. Such experiences are not only possible, but it’s also our aim with patients of any age, to make sure that they grow older with teeth that are as healthy as possible. While the dentist’s experience is obviously going to be of primary importance to patents, they also want a North Vancouver dental clinic where they feel entirely at ease coming in for a visit. That’s especially true if they’re visiting for any type of major restorative procedure. We strive to make it so that you’ll be relaxed and comfortable, and that you’ll understand that you’re in good hands here at Quayside, and soon you’ll be out the door, discomfort free, and with healthy teeth that are in their best condition and ready to serve you as intended. And of course, that often also means being able to flash a smile that you’re proud of! 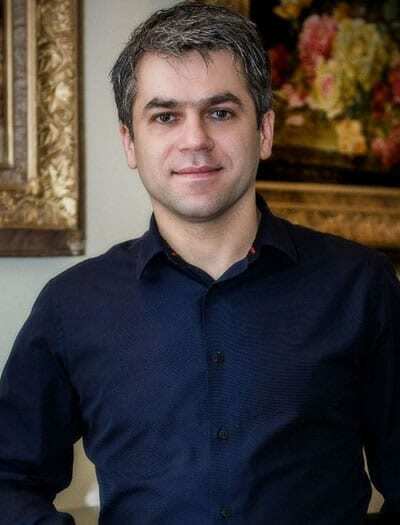 Dr. Afshin Moghaddam grew up in Tehran, Iran; after high school graduation he moved to the Ukraine and completed his dental education at the Medical University of Bogomoltsa earning his DMD with honours in 1998. He completed a two year fellowship in post-graduate Education. He also practiced dentistry during a 5 year stay in Italy, following certification. He moved to Canada in 2011 and completed the Board of Equivalency process for qualification and district licensing process with a certificate of qualification from the National Dental Examination Board of Canada. He has a keen interest in all aspects of dentistry and is dedicated to the newest advancements in cosmetic dentistry; keeping up to date with the latest technologies. He has a gentle touch, and patient care and quality dentistry is of utmost importance to him. He loves spending time with his two lovely children, and enjoys travelling, the great outdoors, running, tennis and swimming. Other than English Dr. Moghaddam speaks fluent Russian, Farsi and Italian.